If you are serious about your training, and are wanting to train indoors, there are a few pieces of equipment you will need, such as a pull up bar. In this article, we will be looking at which is the best doorway pull up bar for Calisthenics training. A doorway mounted is definitely one of the options that you should be considering. Before choosing, you need to be made aware of a few things that may or may not affect your final decision. First, realize that you are not going to be just limited to the pull-up exercise to build functional strength and stability when using a doorway pull up bar. In addition to this, you can also do core strengthening exercises such as leg raises as well, to help to build a stronger core. To give you a visual example, check out the video below. The video demonstrates the Ultimate Body Press Bar. When purchasing a doorway mounted bar, you’ll want to look for one that is going to be as comfortable as possible to use, and has a bar that is long enough for you to completely place both hands at least shoulder width apart. If you can go wider, that’s great as it will allow you to do some more advanced moves as you progress, such as wide-grip pull-ups or typewriters. Avoid using a bar that feels uncomfortable to grip. You don’t want to compromise your effectiveness of your workouts because it is painful to complete your pull ups due to a poor choice in bar so make sure the bar is smooth and comfortable to hang from. In addition to that, you’ll want to look for a bar that is corrosion resistant and has a very durable frame, preferably steel or other strong metal. These bars will last longer, and are more likely to resist damage from everyday usage. Description: In addition to traditional pull-ups and chin-ups, the bar allows you to perform closed-wide angle and hammer grips as well as multiple leg raises and oblique curls. Built to last, this bar is constructed of high-grade steel with ProSource Comfort Grip technology for a secure and pain-free grip. The bar’s maximum weight capacity is 300 pounds within a sturdy doorframe. Description: The Elevated Chin Up Station instantly and easily mounts in a standard doorway with no screws, using leverage and gravity. The Station can be used for chin ups and pull ups in several hand positions at two elevations, as well as sit ups, push ups, and dips. 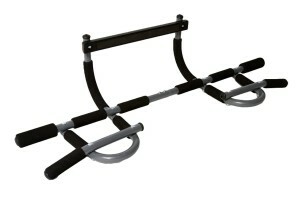 Description: This doorway pull up bar is a versatile and fun strength training tool. 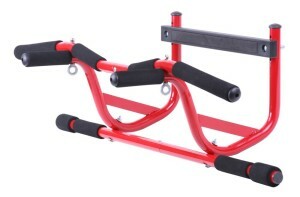 Its easy to use and fits in the smallest places for a convenient and effective workout experience. 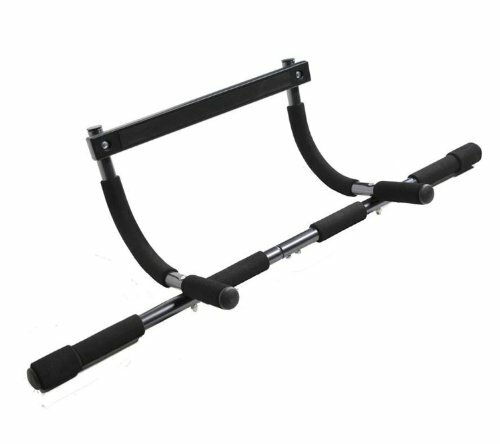 Purchase this bar separately or add other Ultimate Body Press products for even more versatility. Oh and by the way….before you go shopping for your doorway pull up bar make sure that you have the door frame measurements where you intend to place the bar. This will ensure that you will have any easy fit with any model you’re considering. 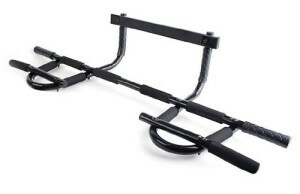 If you are just starting out with Calisthenics training or are looking for a low cost option that will allow you to train in your home, office or Hotel/Motel room, you can’t go past a doorway pull up bar. When utilized properly, you will see massive strength gains! However, if you are wanting a more sturdy option that provides greater flexibility in terms of the range of exercises, you will probably want to look at one of the alternatives mentioned near the start of this article, such as a wall mounted bar. Also, if you are taller than average or are wanting to do leg raises etc, then either get a completely different type of bar or go for the GoFit model. I hope that this article about which bar is the best doorway pull up bar for Calisthenics, will help you to decide on pull up bar is right for you. Please feel free to leave a comment or sign up to our FREE newsletter below. Click here to return to our homepage where we discuss the benefits of Calisthenics. These indoor pull-up bars are an awesome way to get a good workout in the convenience of your home! Very informative and well-written article, thanks for the info! No problems Christopher, in fact you are welcome…and you are right, these bars are great for training at home. My son purchased the first exercise bar in your review. He really likes it and finds it easy to attach and detach. He uses is at least 4 times a week and has not had any issues with it. I like it because it does not leave any marks on my wall or pull the molding from the wall. This is a good sturdy item. Robin. Robin, thanks for your comment. You are spot on with regards to that specific model. They are a great bit of kit. I’m glad your son is using it and it’s not collecting dust somewhere as often happens. Great article. Nice and easy to read and very informative. Keep up the good work. Gill, I’m glad you liked the article and that you found it informative. If you ever need to know something about Calisthenics and you can’t find the answer here at Strength and Stability and I’ll do my best to answer your question. Thanks so much for this. I will be using your fantastic tips in my office! No problems. The doorway pull up will work well there. Well written article and now I understand the differences. I wanted to buy one of these for a while and now I am going to get the wall mounted one. Thanks. Glad the article helped you make the right decision for you. Feel free to email me if you need anything else.